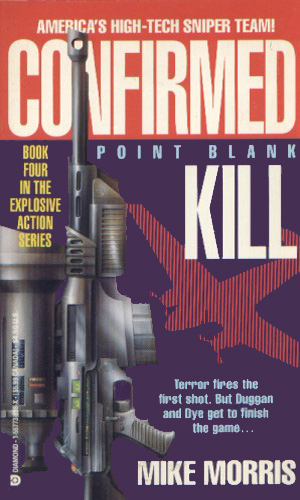 Con Duggan and Steven Dye are assassins for the CIA. As the President grew more and more angry with the evil about the world, causing trouble not just for his country but for the rest of humanity, he desired a way to strike at them one by one. When he heard of a incredible new rifle capable of killing from a far distance if the right man is operating it, he got an idea and ordered a special team be established use this weapon to seek out these enemies and destroy them. The small group created to carry out this directive is told that the money was unlimited, the resources was unlimited, and the support was unlimited. And the scope was also unlimited. It didn't matter whether the targets were in the U.S. or overseas, American citizens or foreigners. If they posed a threat, they were to be eliminated. The strike team of this small group consisted of two people, with just a handful of poeple knowing anything about the mission or the team members. The younger of the two is Steven Dye, a technology wizard and the inventor of the rifle in question, the "SIKIM 1000 multiple-delivery killing tool". Though he hasn't any field experience, his knowledge of the capabilities is total and his enthusiasm almost as much. The experienced leader is Con Duggan, a retired Marine Master Sergeant with years of sniper experience. Having worked for nearly a decade alongside a CIA agent in the jungles of Vietnam, his was the first name thought of by that agent, now Director of Operations for the CIA, when the group was founded. Duggan, being retired and happily spending his time fishing and enjoying solitude, was reluctant to return to duty but eventually the proding of his friend worked and he agreed. Training a young, inexperienced operative like Dye wasn't something he looked forward to but the two soon hit it off and a partnership was created. A group of assassins-for-hire have been employed to take out the officials meeting to celebrate the opening of the Chunnel, the tunnel under the English Channel. 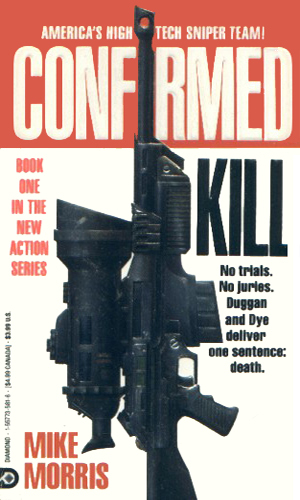 Duggan and Dye are sent to kill the killers. He was known as the godfather of crime all along the Pacific rim and he was untouchable by all the countries who wanted him behind bars. He wasn't untouchable to Duggan and Dye. The terrorists were in Nevada with enough nerve gas to kill every living creature for a thousand miles in all directions. Duggan and Dye were there to stop them. The kidnapping of a U.S. Senator was simply for bait to lure Duggan and Dye within reach of a criminal genius who knew his continued success demanded the pair be eliminated. I didn't want to include this series at first because it seemed to be military in nature. Once I read it, though, I saw it definitely fit. The orders come from the President through the CIA and the action is as covert as you can get. A definite fit. The writing is quick and deadly, like the characters. Bad guys are very bad and the good guys would wear white hats if they wore hats. Nevertheless, it was refreshing to just throw out gray areas and live simply. The friendly banter between the two men is fun and so is the respect they both have for the other. This makes up a bit for the weak plots. 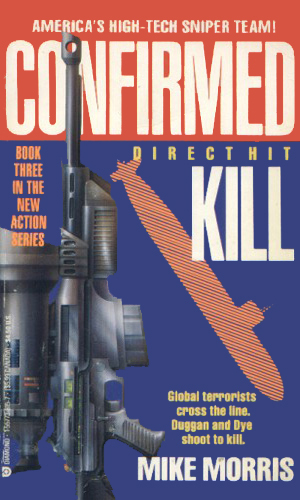 I just wished the publisher had come up with a better series name. 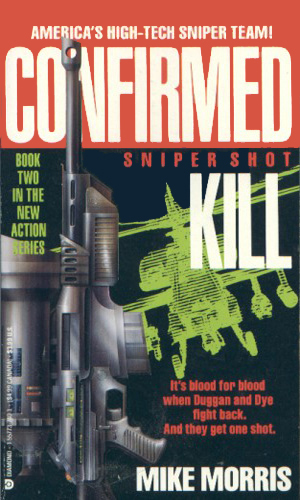 "Confirmed Kill?" Very odd. How about "The Snipers"? Much better.